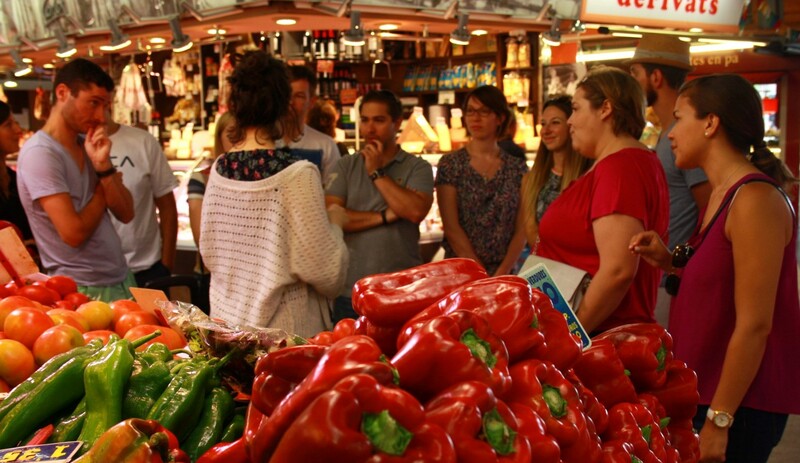 Whether you like to eat, cook, enjoy, drink or get to know Barcelona through a local chef, a hands-on cooking workshop is one of the best ways to immerse yourself into our culture by cooking and eating a Mediterranean Meal. When you book a Spanish Cooking workshop, we will be waiting for you in bcnKITCHEN at 11 A.M. We meet there, where we explain you a few things about the ingredients and the dishes we are going to cook and then we head off to Santa Caterina Market, a local market in el Born, where you will collect the freshest and most delicious local ingredients, which you will be using during the cooking lessons. Roll up your sleeves and put an apron on, you’ll be cooking a four-course meal, combining the ingredients you bought in the market, with the explanations and assistance of our local chef, and learning how our best-known dishes are cooked, at home, in restaurants and in the villages where these dishes are typical from. Everything cooked in a top-class culinary school on the very same street, full of natural sunlight, and all in the center of the trendy el Born neighbourghood. After cooking, time to enjoy: your well deserved lunch, eating the dishes you have prepared, paired with an excellent local Spanish wine, sitting together with the whole group and the chef, in a fun and friendly atmosphere. participate in this fun, friendly and informative workshop, held in a professional kitchen in the exciting neighborhood called El Born, and you’ll get to know one of our best secrets: our gastronomy. Included in these workshops are: all the ingredients and materials for the class, lunch consisting in what has been prepared during the class; wine, water and all the recipes. Just bring your enthusiasm and interest….You can check availability and book online here. Artículo anterior La Panxa del Bisbe, or “The bishop’s belly”.